Beautiful sunny day at the breakfast bar! Rare high season opening due to cancellation—price drop for week of July 6. For more praise from happy renters, please read on. 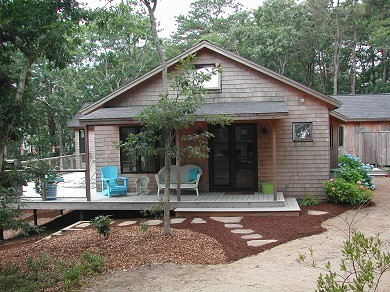 Our 3-4 bedroom, 3.5 bath custom-built home in Wellfleet was built in 2005. 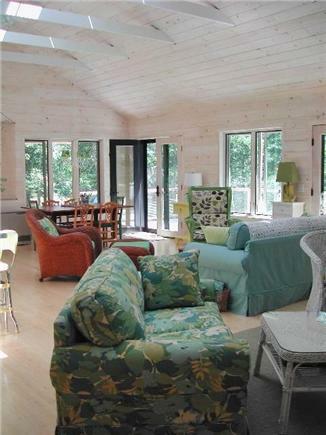 Set on a lovely, one-acre wooded site, this pristine home with vaulted ceilings boasts a sparkling light-filled interior. 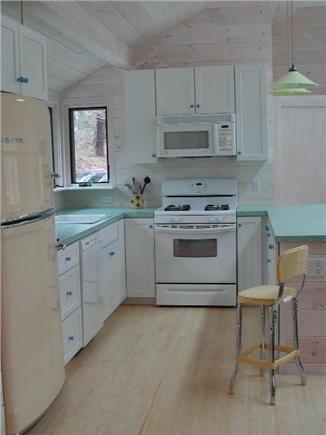 It is charmingly decorated, with bamboo hardwood floors throughout, custom tiled baths and hearth, a cute 'retro' kitchen with all amenities and a breakfast bar, plenty of windows and skylights, a generous deck with gas grill, and an outdoor shower. The expansive great room is composed of a dining area and 2 separate seating areas, and is equipped with large HDTV (with cable, VCR, DVD) and stereo system. Across the back of the house are 3 bedrooms: master with queen bed and private bath, 'kids' room with a twin/trundle and sleeping loft equipped with futons, and a 3rd bedroom with full bed. 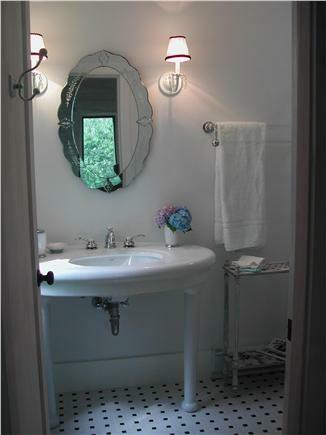 A shared full bath lies between latter 2 bedrooms. 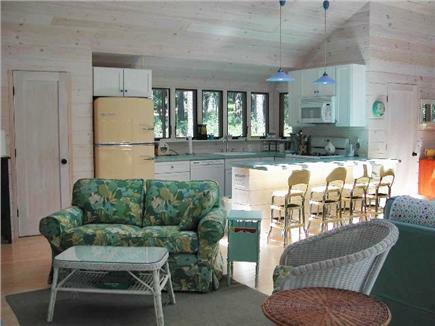 The light, walk-out basement/rec room has a full-sized futon and 73'' flatscreen TV, equipped with full cable and Wii. It's the perfect hangout spot for the teens and kids in your party. There are full laundry facilities and high speed wireless internet. 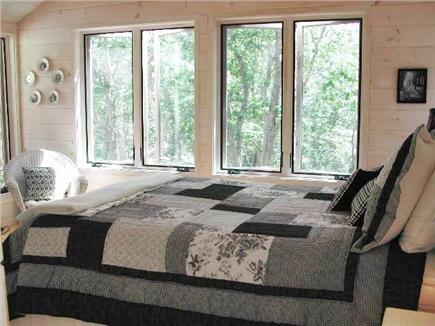 It's a wonderful house for 2 families to enjoy--kids love the loft with its peekaboo 'spy' window. There's lots of room to relax indoors or sit on the deck, watch the hummingbirds at our feeders, and the foxes and deer that wander through. Walk to Gull or Higgins Pond (at 'the Sluice')--great ponds for swimming and boating. 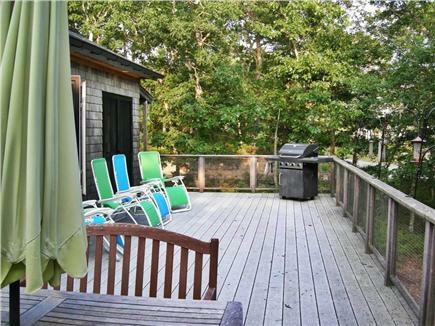 It's a quick drive to Wellfleet Center or any of the ocean beaches--or bike if you prefer. Tired of the beach? Enjoy Wellfleet's great galleries, shops and restaurants. Take a leisurely stroll through the Audubon bird sanctuary, catch a fishing charter out of Wellfleet Harbor, or a whale watch from nearby Provincetown. In the evening, catch a movie at one of the country's few remaining drive-in theatres. On the premises you will find beach towels, beach chairs, umbrellas and toys for your use, as well as books and videos, booster seats and Pack 'n Play, hair dryer, etc. Those with severe allergies please note that although the house is a no-pet rental, there has been an occasional cat or dog on the premises. Please note that due to newly passed Lodging Tax, we are required by Massachusetts law to add an additional 12.44% fee to weekly rentals. 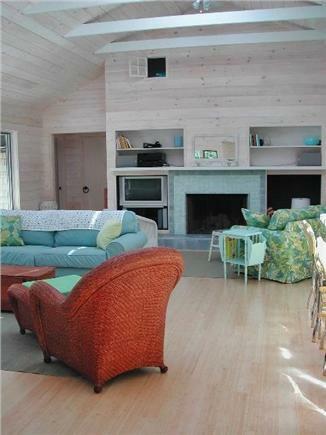 Long-Term Rental (1 month or more): Our home combines the charm of a beach cottage with year round, cozy livability. Available off season mid-October through mid-June. Monthly rate $1400. Monthly rental INCLUDES basic cable/phone and internet. Rent does not include additional utilities. 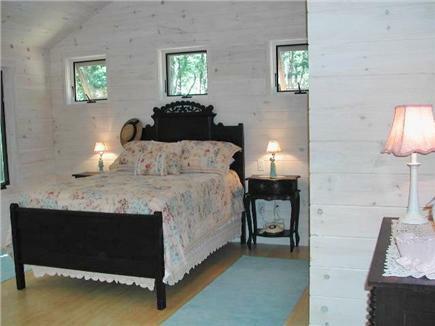 This is a lovely home in the winter, and gets lots of light through numerous windows and skylight. Each room is individually heated by economical units, and of course, the wood burning fireplace comes in handy. Additional pricing info: Discount for multiple weeks, or returning renters. MA law now requires additional 12.5% lodging tax. State and local taxes of 12.45% will apply.